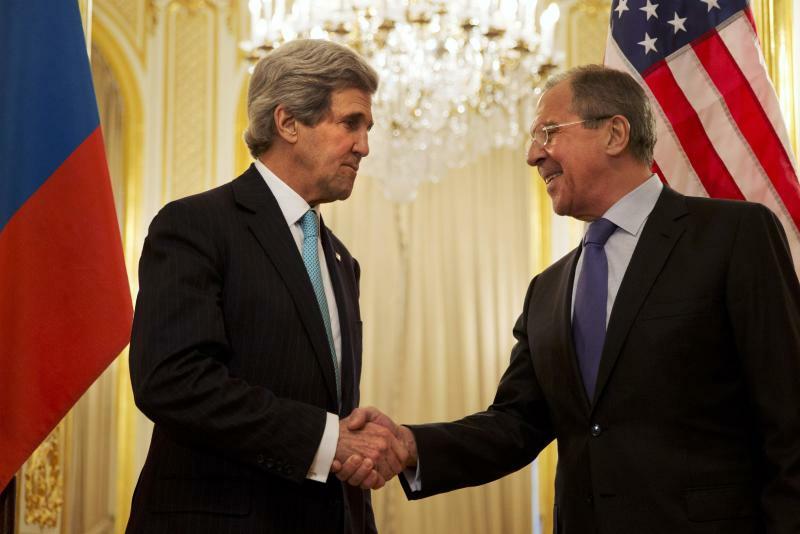 PARIS (AP) — Russia on Sunday set out demands for a diplomatic resolution to the crisis in Ukraine, saying the former Soviet republic should be unified in a federation allowing wide autonomy to its various regions as U.S. Secretary of State John Kerry and Russian Foreign Minister Sergey Lavrov met in Paris in another bid to calm tensions. After a brief call on French Foreign Minister Laurent Fabius, Kerry sat down with Lavrov at the residence of the Russian ambassador to France to go over Moscow's response to a U.S. plan to de-escalate the situation as Russian troops continue to mass along the Ukrainian border. The men said nothing of substance as they shook hands, although after Kerry ended the photo op before their meeting by thanking assembled journalists, Lavrov cryptically added, in English, "Good luck, and good night." Their meeting ended Sunday evening after four hours, including dinner. Kerry was conferring with aides and did not immediately provide a briefing on their lengthy talks. "We have absolutely no intention of, or interest in, crossing Ukraine's borders," Lavrov said. And, despite the Russian assurances, U.S., European and Ukrainian officials are deeply concerned about the buildup, which they fear could be a prelude to an invasion or intimidation to compel Kiev to accept Moscow's demands. In his interview, Lavrov made clear that Moscow believes a federation is the only way to guarantee Ukraine's stability and neutrality. "We can't see any other way to ensure the stable development of Ukraine but to sign a federal agreement," Lavrov said, adding that he understood the United States was open to the idea. U.S. officials have been coy about their position on a federation and insist that any changes to Ukraine's governing structure must be acceptable to the Ukrainians. Ukrainian officials are wary of decentralizing power, fearing that pro-Russia regions would hamper its western aspirations and potentially split the country apart. However, they are exploring political reforms that could grant more authority to local governments. The plan that Kerry and Lavrov are discussing covers Ukrainian political and constitutional reforms as well as the disarmament of irregular forces, international monitors to protect minority rights and direct dialogue between Russia and Ukraine, according to U.S. officials, who say it has backing of Ukraine's government. Sunday's meeting follows an hourlong phone call Friday between U.S. President Barack Obama and Russian President Vladimir Putin in which Obama urged Putin to withdraw his troops from the border with Ukraine. The Russian leader, who initiated the call, asserted that Ukraine's government is allowing extremists to intimidate ethnic Russians and Russian-speaking civilians with impunity — something Ukraine insists is not happening. That call did little to reassure U.S. officials that Russia is not planning to invade Ukraine after its annexation of Crimea that the west has condemned as illegal and a violation of Ukraine's sovereignty and territorial integrity. The United States and Europe have imposed sanctions on senior Russian officials in response, sparking reciprocal moves from Moscow. In the interview with Russian television, Lavrov called the sanctions a "dead-end" strategy that would not achieve results and accused the west of hypocrisy. He said it was inconsistent for the west to refuse to recognize Crimea's annexation, which followed a referendum on joining Russia that was overwhelmingly approved, while at the same time accepting the new government in Kiev, which was formed after the pro-Moscow president fled the country. "If they are willing to accept the first event as legitimate, then surely they are obliged to acknowledge the second," Lavrov told Russia's Channel One television. White House officials described the call as "frank and direct" and said Obama had urged Putin to offer a written response to a diplomatic resolution to the Ukraine crisis that the U.S. has presented. He urged Moscow to scale back its troop buildup on the border with Ukraine, which has prompted concerns in Kiev and Washington about a possible Russian invasion in eastern Ukraine.